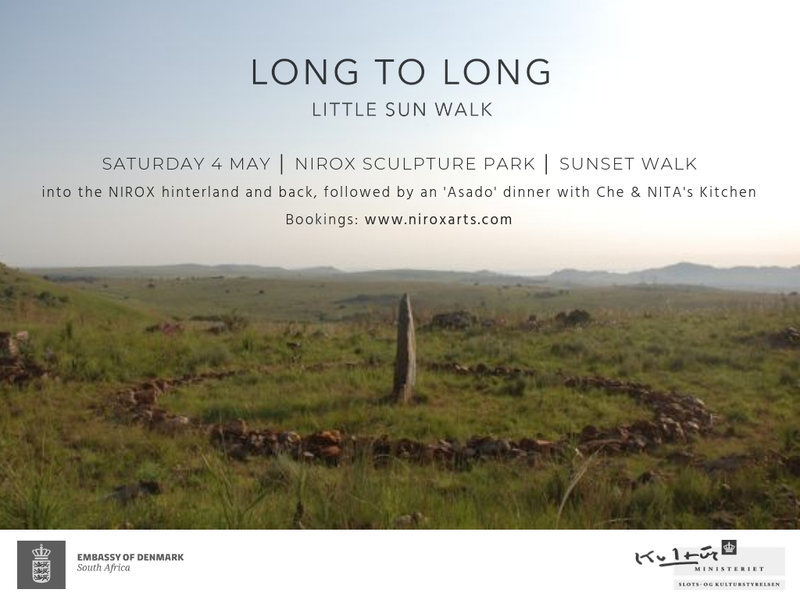 The NIROX Winter 2019 Sculpture Exhibition, titled the POWER OF SITE and co-curated with Lorena Guillén Vaschetti (Arg) and Adam Jeppesen (Den), opens on May 4th with a unique late afternoon walk from the Sculpture Park into the highveld grasslands surrounding NIROX Sculpture Park to visit the hilltop installation of Standing Stone Circle by the celebrated British artist Richard Long. Following a drink at sunset guests will walk back to NIROX at dusk for an authentic Argentinian ‘Asado’ prepared by Che Argentinian Grill, in collaboration with NITA’s Kitchen. Long-to-Long: Little Sun Walk is a collaboration with the Danish Embassy and Little Sun, a global project founded by internationally renowned artist Olafur Eliasson to make clean energy a reality worldwide. As dusk sets, the walk walk will be lit by Little Sun solar lights carried by schoolchildren. Each adult ticket purchased for the event will provide one solar lamp to a student living with unreliable or no access to electricity. Using solar energy in remote areas means the children can read, study, and play safely after the sun has set. This event is exclusive to invited guests and the schoolchildren around whom the experience is centered. The walk traverses 5 kilometers into the heart of the Cradle of Humankind in the company of 50 to 75 local schoolchildren, guided by the artists Hannelie Coetzee and Richard Forbes, whose deep knowledge and experience of the local terrain and history, has informed their practices and will be generously shared to create a memorable illuminating experience for all. Schoolchildren participating in the project are pupils of the National School for the Arts (NSA), the Matla School, Kromdraai, and schools serviced by the Columba Leadership Academy. NIROX and NSA share a wide range of collaborative initiatives that expose future artists from all disciplines to the experience and insights of practicing artists from across the world, engaged in NIROX’ artist’s residency, workshops and exhibition programs. NIROX hosts Columba’s Cradle Residency which is due to commence operations coincidentally with The Power of Site, providing a platform to enhance Columba’s successful development of youth leaders with the character and resilience to transform society. NIROX is proud to be part of these crucial collaborations. The event is made possible with the generous support of the Danish government. The Power of Sun for Everyone! The walk will set-off between 3.30pm to 4pm, no later. Good fitness and footwear is a requirement as this is a physical activity. We recommend all participants to bring their own water bottle to stay hydrated. Note that a liability waiver will need to be signed before commencing the walk. Booking is essential. Guest numbers are limited, so early bookings advised. - another Little Sun will be donated to one participating schoolchild. Bernie’s Bar will be open for business throughout the event. NIROX is an outdoor venue and as such is subject to the weather. While every care will be taken to ensure an enjoyable experience for guests, in the event of inclement weather a decision will be taken on how to proceed. No refunds. Children must be under adult supervision at all times. Entry to the park is at your own risk. NIROX is not responsible for any loss, injury or damage. For further information contact Lloyd 082 875 2865 or Tammy 083 600 2280. Little Sun’s solar solutions are for everyone. They benefit communities living off the electrical grid by working with local entrepreneurs, creating local jobs, and generating local profits. Artist Olafur Eliasson officially launched the Little Sun social business in July 2012 at London’s Tate Modern to bring clean, affordable solar energy to the 1.1 billion people living without electricity. Since then, more than 830,000 Little Sun lamps have been distributed worldwide, with more than half going to off-grid areas. Purchasing Little Suns in areas of the world with electricity makes the products available in off-grid areas at reduced, locally affordable prices, where they provide a clean alternative to toxic and expensive fuel-based lighting and a steadfast and clean alternative to relying on the electrical grid. In 2017, Eliasson launched the Little Sun Foundation as an extension of the social business. The non-profit brings light to the most vulnerable communities worldwide who are off the grid and beyond the reach of Little Sun’s entrepreneurial distribution models. These include remote schools, refugee camps, and people affected by natural disasters. Ample secure parking at the venue.